My last day in Sicily back in May was spent under the brightest blue skies possible. 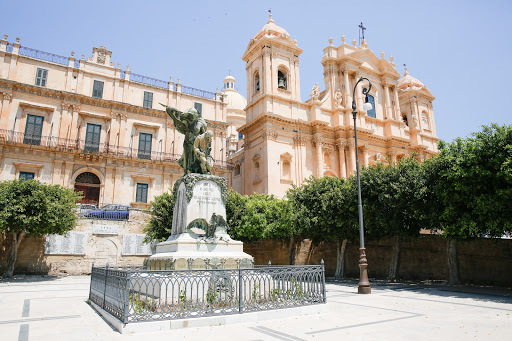 We ventured out to discover Noto, this incredible little town filled with the most pristine white-washed architecture every corner you turned. Part of the reason we chose to visit Noto was to see the May spring celebrations in the form of flower displays laid along the cobbled streets. We were there a week early for the main festivities, but we did catch a glimpse of one of the flower displays which you can see in the first picture below! Walking around Noto, it was amazing to see just how diverse the architecture is on the island. The bright pearly marble was a far cry from the more gothic feeling back in Catania. If you ever get over to Sicily, make sure you take the time to visit as many churches as possible. I couldn’t believe how each and every one we visited had a completely different, but equally stunning interior. You glance in only to discover walls of intricate murals, all embellished with hints of gold. It’s no wonder Dolce & Gabbana took inspiration for their entire AW 2013 collection from just one of the Cathedrals in Sicily – #lovethem!! After a leisurely morning spent walking, tanning and, of course, lunching Italian style, we headed to Syracuse for some much needed fresh sea air. What I loved most about the seaside town was how much its history is completely intertwined with ancient Greece. The whole town is dotted with marble ruins just like Athens. In fact, the Duomo of Syracuse is actually an ancient Greek temple encased in a catholic cathedral – definitely worth a visit! If relaxing is more your thing, you can hop on a local boat tour which takes you around the town. You can find these under the bridge connecting Syracuse to the mainland. Sadly, I didn’t have my bikini with me this time, so I had to settle with an ice-cold lemon granita to cool down! What amazing photos – this looks like an absolutely incredible place! This sounds amazing and your photos are stunning. This post makes me want to start packing my suitcase right now!! I just love Italy – especially all the peachy pink buildings and how pretty they look under the blue sky! It's been almost two years since my last visit and I really think I need to get back in a hurry.